Vick Mickunas' interview with Smith Henderson. After much deliberation I have decided to declare 2014 to be The Year of the Debut Novel. Every year I compile a list of my favorite fiction and non-fiction titles to share with readers of the Cox Ohio newspapers. I was going through my fiction stack and realized that half the books I'm considering to be my favorites from the past year are debuts. 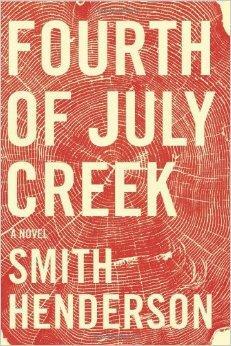 Now Smith Henderson's superb first novel "Fourth of July Creek" has landed upon that select stack. Wow, what a book! Henderson sets most of this story in his native state of Montana. Our main character, Pete Snow, is a social worker who is trying to help out families that are living on the fringes of society. One day a young boy appears in a nearby town. The lad is semi-feral, he's apparently been living out in the wilderness with his survivalist father. Pete gets involved and soon he meets Benjamin Pearl, the father of the young boy. But where is the rest of the Pearl family? Ah, now that is a mystery. This is just one of the fascinating threads in this magnificently sprawling humdinger of a story. Books like this one are the reason that I read. Henderson's debut is magical. In this interview the author talks about how this story came to be, his process, and his day job; Henderson works for an advertising agency on the west coast.